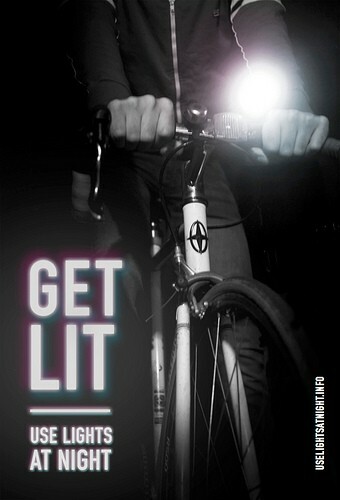 Steven Vance of the sustainable transportation blog Grid Chicago started a campaign last year called Get Lit to encourage cyclists to use lights at night by giving out free lights to riders without them. The Active Transportation Alliance has done several bike light giveaways in the last few years, and Vance volunteered at a couple of them. He noticed that most of the cyclists who were riding without lights also didn't know that they're required by law to have a white headlight, so with the help of some friends, he made up educational postcards that he's been distributing. Vance now wants to do a headlight giveaway, and is soliciting donations so he can buy the lights (there's information on his blog post about how to donate). He says he still sees a lot of people biking without lights, and wants to change that. Like Vance, I see plenty of light-less cyclists and it always makes me nervous for them. When I first started biking in Chicago, I often was one of them, but I've wised up some since then and now go for the brightest light possible—and even so, drivers sometimes still don't see me. I've seriously considered buying a battery-operated string of Christmas lights and wearing them. I still might, actually.